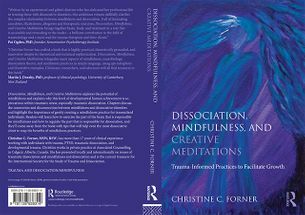 Dissociation, Mindfulness, and Creative Meditations explores the potential of mindfulness and explains why this level of developmental human achievement is so precarious within traumatic stress, especially traumatic dissociation. The International Society for the Study of Trauma and Dissociation is an international, non-profit, professional association organized to develop and promote comprehensive, clinically effective and empirically based resources and responses to trauma and dissociation and to address its relevance to other theoretical constructs. Although they are primarily a professionally oriented society, they welcome both professional and lay members. Education is one of their primary goals. We work to achieve that goal partly through training programs, conferences and the Journal of Trauma & Dissociation. The ISSTD has given awards to professionals and lay people who have contributed to the study of trauma and dissociation and to the ISSTD. The Sensorimotor Psychotherapy Institute (SPI) is an educational organization dedicated to the study and teaching of a somatic approach to clinical psychotherapy practice. Sensorimotor Psychotherapy is a body-oriented talking therapy that integrates verbal techniques with body-centered interventions in the treatment of trauma, attachment, and developmental issues. SPI offers trainings and workshops for psychotherapists and allied professionals in Sensorimotor Psychotherapy and courses for body therapists on somatic resources. The courses taught by SPI are based on principles of mindfulness and mind/body/spirit holism and informed by contemporary research in neuroscience, attachment theory, trauma, and related fields. EEG Spectrum International, Inc. is a corporation founded to continue the work of EEG Spectrum, Inc., which was a seminal enterprise in the history of neurofeedback. Today EEG Spectrum International, Inc. is recognized within the neurofeedback community as being in the forefront of the field as a result of its effectiveness in addressing a wide range of therapeutic applications. EEG Spectrum International, Inc. now has more than 600 Affiliates and Associates worldwide. EEG Spectrum International, Inc. is currently assisting in research in the areas of autism, chemical sensitivity and substance abuse, as well as optimal performance for nonclinical populations. It is also involved in a study of the applications of the QEEG to neurofeedback practice. What goes on biologically in the brain during traumatic experience and its resolution? Which psychotherapeutic procedures are most effective with traumatic symptoms, for which patients and why? How can we best measure clinical efficacy and treatment outcome for trauma survivor populations? The Trauma Center is a program of Justice Resource Institute (JRI), a large nonprofit organization dedicated to social justice by offering hope and promise of fulfillment to children, adults, and families who are at risk of not receiving effective services essential to their safety, progress, and/or survival. The Executive Director of the Trauma Center is Joseph Spinazzola, Ph.D., and the Medical Director and Founder of the Trauma Center is Bessel van der Kolk, MD, who is an internationally recognized leader in the field of psychological trauma. Their mission is to help individuals, families and communities that have been impacted by trauma and adversity to re-establish a sense of safety and predictability in the world, and to provide them with state-of-the-art therapeutic care as they reclaim, rebuild and renew their lives. Co-occurring issues, such as addictions, self-injury, and suicidality.